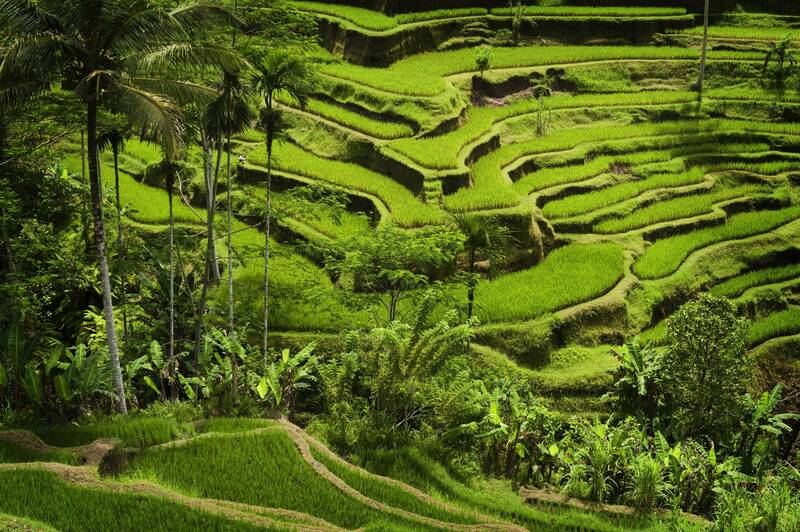 Subak is the water management system for paddy fields on Bali island, Indonesia which was developed in the 9th century. For Balinese, irrigation is not simply providing water for the plant's roots, but water is used to construct a complex, pulsed artificial ecosystem. The system consists of five terraced rice fields and water temples covering nearly 20k ha. The temples are the main focus of this co-operative water managementch are known as Subak. Subak is a traditional ecologically sustainable irrigation system that binds Balinese agrarian society together within the village's Bale Banjar community center and Balinese temples. The water managements is under the authority of the priests in water temples, who practice Tri Hita Karana Philosophy, a self-described relationship between humans the earth and the gods. 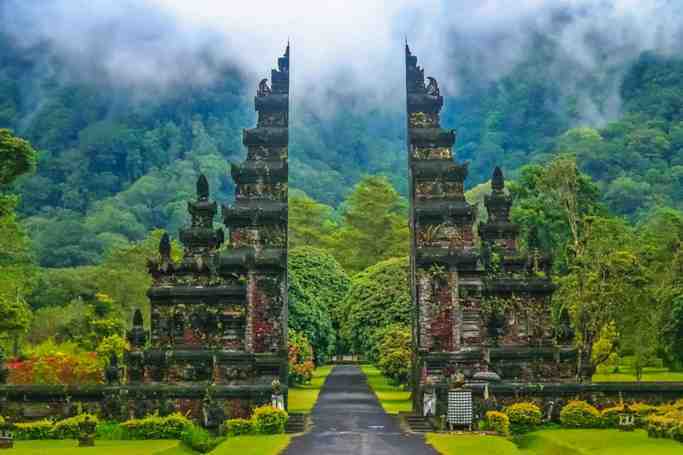 Tri Hita Karana draws together the realm of spirit, the human world and nature. The overall Subak system exemplifies this philosophical principle. Water temple rituals promote a harmonious relationship between people and their environment through the active engagement of people with ritual concepts that emphasise dependence on the life-sustaining forces of the natural world. 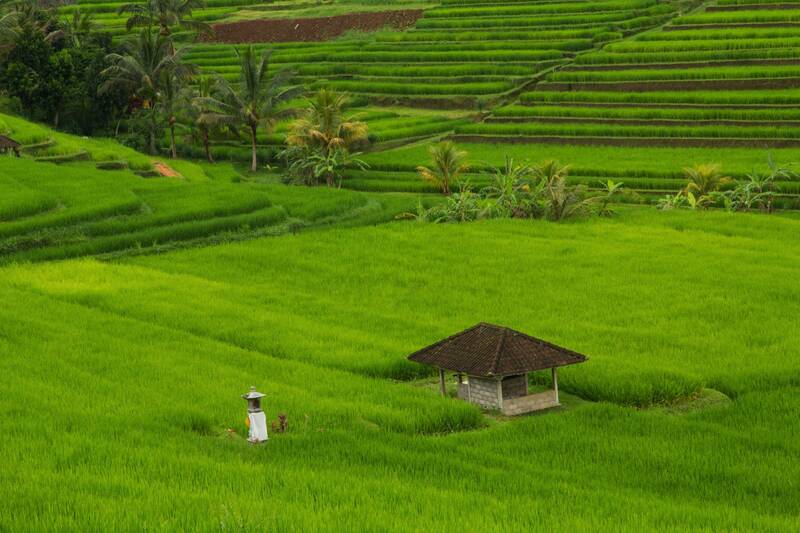 Rice is seen as the gift of god, and the subak system is part of temple culture. Subak components are the forests that protect the water supply, terraced paddy landscape, rice fields connected by a system of canals, tunnels and weirs, villages, and temples of varying size and importance that mark either the source of water or its passage through the temple on its way downhill to irrigate subak land. Rice, the water required to grow rice and Subak, the cooperative canal system that controls the water, have together shaped the landscape over the past thousand years. Water from springs and canals flows through the temples and out onto the rice paddy field. In total, Bali has about 1,200 water collectives and between 50 and 400 farmers manage the water supply from one source of water. The property consists of five sites that exemplify the interconnected natural, religious, and cultural components of the traditional subak system. The sites are the Supreme Water Temple of Pura Ulun Danu Batur on the edge of Lake Batur whose crater lake is regarded as the ultimate origin of every spring and river, the Subak Landscape of the Pakerisan Watershed the oldest known irrigation system in Bali, the Subak Landscape of Catur Angga Batukaru with terraces mentioned in a 10th-century inscription making them amongst the oldest in Bali and prime examples of Classical Balinese temple architecture, and the Royal Water temple of Pura Taman Ayun, the largest and most architecturally distinguished regional water temple, exemplifying the fullest expansion of the subak system under the largest Balinese kingdom of the 19th century. These architectural sites are inspired by several different ancient religious traditions, including Saivasiddhanta and Samkhyā Hinduism, Vajrayana Buddhism and Austronesian cosmology.